Press Release: Canada’s new Food Guide will bolster efforts to curb Canada’s Childhood Obesity Epidemic. January 24, 2019. Dr. Warshawski speaks with CBC News Radio-Canada about the proposed sugary drink tax in the Northwest Territories: Should the NWT tax sweetened drinks? Press Release: Our children’s health must not be for sale. December 3, 2018, CNW. Dr. Warshawski spoke with Shen Wenjie at Sing Tao Daily about Canadian children’s physical activity. Dr. Tom Warshawski discusses the PST exemption on sugary drinks in BC, “Health expert holds out hope for B.C. tax on sugary drinks“. The Star addresses a new study that states “Dads need to play a greater role in preventing childhood obesity.” Dr Tom Warshawski comments. Dr. Tom Warshawski is quoted in Global News. Dr. Tom Warshawski and Rita Koutsodimos (BC Alliance for Healthy Living) dispel the recent Canadian Taxpayers Federation report that addresses sugary drink taxation while speaking with Prince George Now. Dr. Warshawski and Mary Lewis are featured in The Globe and Mail and speak about protecting our kids from junk-food ads. Click here to read more. LiGHT, Living Green and Healthy for Teens – Announced today by Minister Jane Philpott. Childhood Obesity Foundation funded by the Public Health Agency of Canada in partnership with Ayogo Health Inc., Merck Canada and Heart and Stroke, proud to develop a mobile program for youth and their families. See the Government of Canada’s media release. Will a sugary drinks levy benefit Canadians? New research says yes. March 16, 2017 (Toronto, ON) – New research by the University of Waterloo commissioned by leading health organizations reveals an excise levy on companies that produce sugary drinks would go far in reducing death, disability, and health care costs. This adds to the growing body of international evidence that supports the health and economic benefits of a sugary drink levy. The Globe & Mail | Will Bill Morneau save 13,000 lives with a levy on sugary drinks? Dr. Heather McKay’s study is featured in the Globe and Mail that has found teens who have a “couch potato” lifestyle risk having permanent negative effects on their bone health. MEND is featured in The Province. Read more about how MEND promotes fun, physical play while encouraging them to think about all the small choices that can lead to good health, here. 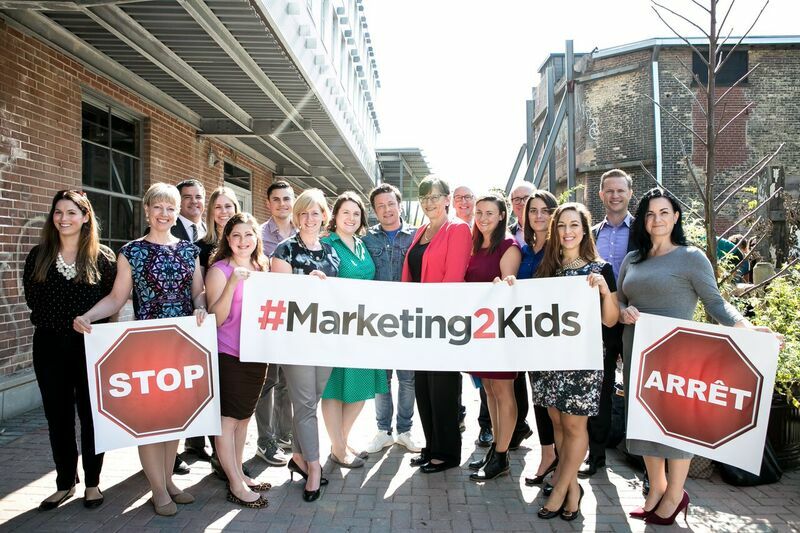 Ottawa – September 28, 2016 – The Stop Marketing to Kids Coalition applauds Senator Nancy Greene Raine for introducing legislation prohibiting food and beverage marketing to children. Click here to review the entire press release. Read about tips to promote healthy weights for children and families in Dr. Warshawski’s interview with CBC News, here. Dr. Warshawski speaks with Cherly Chan at the Vancouver Sun about what parents can do to help support and promote healthy weights in their children. Click here to read. Listen to Dr. Warshawski and Mike Smyth on CKNW talk about a tax on sugary drinks in Canada. Mark Collison, Director, Government Relations & Health Promotion, Heart and Stroke Foundation and Dr. Tom Warshawski interview with Metro News. Mark and Tom talk about the Stop Marketing to Kids Coalition and food and beverage advertising to children. Click here to read the story. Read Tom’s interview with The National Post, Wednesday July 19th, here. Tom speaks with journalist, Michelle Hauser, about healthy weights, active living for the whole family, sugary drinks and marketing to kids. On March 29th, the Province of BC announced an additional $2 million dollars of funding for the MEND program. To read the BC Government News Press Release, please click here. Click here to read about the MEND announcement from CFJC Today, Everything Kamloops! Click here to read about this announcement in Kelowna Now. On March 1st, 2016, the Senate Standing Committee on Social Affairs, Science and Technology released their comprehensive report titled: Obesity in Canada: A Whole-of-Society Approach for a Healthier Canada. The Senate made 21 recommendations for addressing obesity amongst Canadians; two of these recommendations are the taxation of sugar sweetened beverages and restricting the marketing of food and beverages that target children, youth and teens. Restricting food and beverage marketing to kids will provide the protection our children deserve, and will support parents to make healthy choices for their families. This aligns with recommendations put forward by the recently launched national Stop Marketing to Kids Coalition, co-led by the Childhood Obesity Foundation and the Heart and Stroke Foundation. Children are exposed to unprecedented levels of unhealthy marketing in their entertainment, online and recreational activities. To read the Stop Marketing to Kids Coalition Press Release, February 24, 2016, click here. Listen to Dr. Warshawski chat about the added sugars in beverages and a ban on marketing to kids with Mike Smith on CKNW, February 18, 2016. Do You Know How Much Sugar Is In Your Starbucks Drink? The BC Government announces funds for the expansion of Shapedown. Click here to read the press release. Dr. Warshawski comments on the Select Standing Committee on Finance’s recommendation that a tax on sugary drinks is considered in BC. Click here to read the interview at CKNW. Dr. Warshawski is quoted in a recent article in The Province regarding the recommendation for a possible sugary drink tax. Click here to read the article. Dr. Chanoine talks about healthy kids and healthy lunches while he addresses a news release by BC Children’s Hospital. To view the news release, please click here. To read Dr. Chanoine’s interview with Simon Druker on News 1130, please click here. The MEND Program is highlighted in VanCity Buzz this month. Click here to read about MEND and how tot stay healthy and active this fall as kids head back to school. Check out this blog post about MEND programs in Vancouver by British Columbia Mom by clicking here. To view our latest M2K webinars, click here. Dr. Warshawski speaks with Andrew Chang on CBC News Vancouver at 5:00 March 30, 2015. Dr. Dina Panagiotopoulos, MD, FRCPC from the Endocrinology and Diabetes Unit at BC Children”s Hospital talk about sugary foods, salt, sedentary behaviours and how this impacts young children. Click here to listen. Dr. Tom Warshawski speaks with Sam from CKNW on Family Day in the series titled “Your Health First”, Preventable Healthcare. Click here to listen. Dr. Warshawski talks about healthy eating and physical activity in children. This interview discusses the use of BMI as a means for determining healthy weights, the 5210 rule and what moderate to vigorous physical activity is. Click here to listen. MEND helps Chilliwack children and families lead healthier lives! The Chilliwack Division of Family Practice is pleased to support MEND and the Chilliwack Family YMCA. Click here to read about MEND in the Chilliwack and learn about how to register in the program. Cooler weather shouldn’t mean less physical activity. Follow the link to read Dr. Tom Warshawski”s comments about MEND and Shapedown opportunities in Prince George, published here, in the Prince George Citizen. Click here to read about the MEND program in the Peninsula News Review. MEND is available through Saanich Parks and Recreation at Colquitz Middle School. In this article, Dr. Tom Warshawski talks about our changing environment and how it is important to be active, avoid sugary drinks and eat healthy starting at an early age. We are pleased to share this report on our progress with the Childhood Healthy Weights Intervention Initiative. Click here for Our Journey, March 2014. Click here to read the joint press release issued by the Childhood Obesity Foundation, BC Recreation and Parks Association and YMCA of Greater Vancouver regarding the MEND program. This project is funded by the Public Health Agency of Canada. The views expressed in the LiGHT program do not necessarily represent the views of the Public Health Agency of Canada. Check out CBC Live Right Now, a movement to inspire Canada to get healthy. Click here to visit the Live Right Now website.